We have a very interesting rumor for Transformers Movie collectors. A possible Studio Series Bonecrusher may be on the works. An image of Taobao listing was shared via TFCN Group on Facebook. 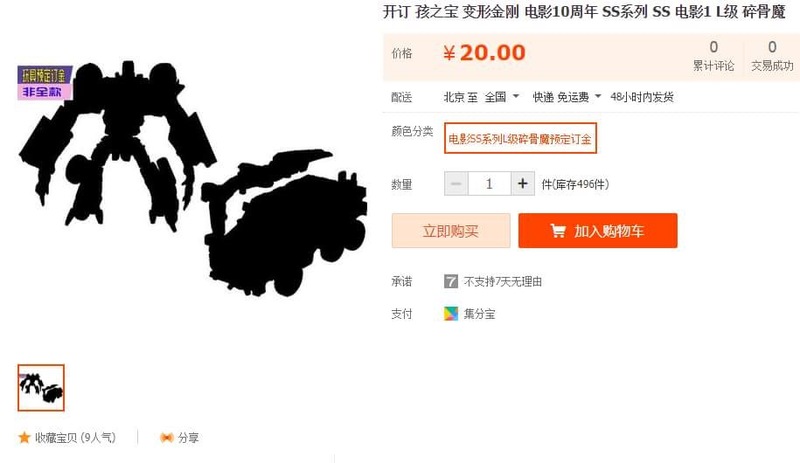 It indicates an upcoming Studio Series Bonecrusher. We only have a placeholder image here (it seems they used the shadow of the 2007 Deluxe mold), so we should take this with a grain of salt until we get an official confirmation. With no information on price or size, we can speculate a lot here. Bonecrusher is another popular character which many fans dream of a new bigger and proper mold. Studio Series already brought a great new Leader Class Blackout, so many fans are hoping for a Leader Class Bonecrusher too. We see that Studio Series toys are now working the scale among all the line. Considering what we saw on the 2007 Transformers movie, a Voyager Bonecrusher toy may work better with the new Studio Series Optimus Prime. What are your expectations? Do you think a new Bonecrusher mold is on its way? Let us know your predictions at the 2005 Boards! Our stores(russian) are shelfwarmwd with berserker as well and he costs 35 dollars so no wonder. I know! It's like, every single photo I've seen of him make him look super detailed and I haven't seen any comparison photos of him with other toys from the movie line so… I assumed he was a voyager without checking. You do that all the time in the movieverse appreciation thread, constantly speculating over the same list like there's some new information when there isn't, so chill out. Haha dude that toy is 10 yrs old! There are billions of pics! It's actually not a bad figure for its time, just way too small. Crowbar's shelfwarming? Must be your area then, because only one's sitting on shelves in my area (At my area's Target, and Wal-Mart didn't even bother to make a space for Studio Series, so there's definitely none there… ) and I've never heard anywhere else of Crowbar shelfwarming. Actually I’ve got some crowbar’s shelfwarming at my nearest store. I gotta pick one up some point. They’ve got premier edition figures down to standard price so I’ll pick up berserker as well. Look at Crowbar shelfwarm! Also, Bonecrusher was the worst TF07 Decepticon. So useless. I like him, but he was hilarously ineffective. Oh wow Bonecrusher, an empty bus destroyed?! You truly are an evil robot. Oh Bonecrusher, how I love thee so. I still remember one of my first movie toys was ol' noodle arms. Still have him in the house. In a movie full of useful Decepticons, Bonecrusher's hi-then-die appearance is legendarily and hilariously impotent. Bonecrusher decided to go up against Mass-murderer Prime, he was pretty-much doomed from the get-go. So was every decepticon ever. Except a certain few. Crowbar barely had a minute of screentime and he got a toy, why should Bonecrusher be any different? I mean the noodle arms were never quite the best but hey. That’s what updates are for. Bump a thread without news!?! Look dude. People don’t know these things. It’s fine. If something like studio series bonecrusher was gonna happen it’d be on the front page for sure. Just relax a bit. The time will come. Bonecrusher doesn't need a SS figure, he was only on-screen for how many minutes? On a side note I hope we see leaks of this dude sometime in September-October. No, I knew the point. I was just correcting bad math.